Suma-dera, also called Joya-san Fukusho-ji, is a Shingon-shu temple erected in the year 886. 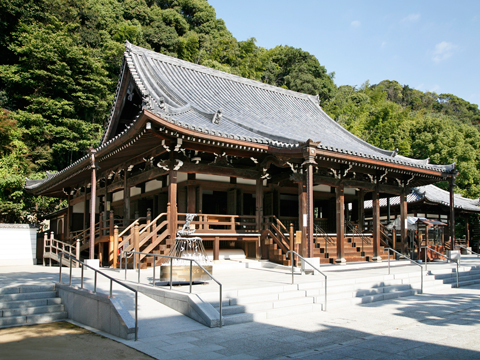 Shingon-shu is a Buddhist sect founded by Kobo Daishi (Kukai). On the temple grounds, beginning with cherry blossoms in spring, one can see the beautiful scene of seasonal flowers interweaving through the seasons. 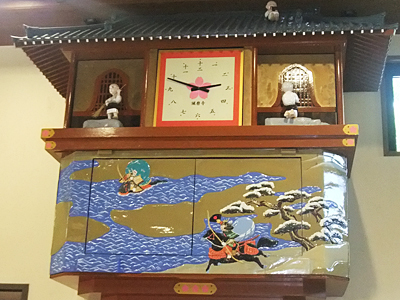 One can also enjoy the pieces of mechanical art (such as marionette clocks) placed throughout the temple. These clever mechanisms are not there just for our pleasure—each also is imbued with its own meaning. Given the beauty of the grounds and the variety of interesting art pieces on display, Suma-dera is loved by many, not just as a refuge for the devoted, but as a space for relaxation. The temple is also famous as a place where one can feel the living breath of the ancient Gempei War (described below). For that reason, many famous figures have expressed—in waka (31-syllable Japanese poem), haiku, Chinese poem, and so on—the rich atmosphere they experienced at Suma-dera. Some of these works are inscribed on stone monuments throughout the temple grounds. Suma-dera is the home of many treasures, including a Buddha statue designated as an Important Cultural Property. These can be found in the Treasure Hall. 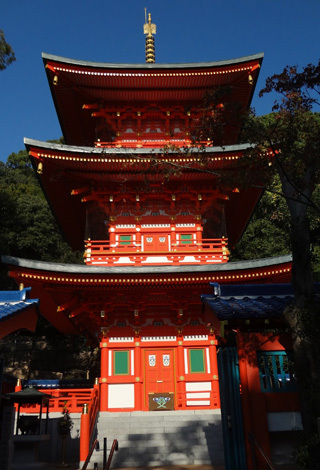 Suma-dera is loved as an ancient temple that conveys the atmosphere of the Gempei War. The samurai appeared around the year 900; at that time, the samurai clans boasting the greatest influence were the Taira and the Minamoto. These two clans eventually entered into a major war, one that involved even the imperial court and aristocrats. 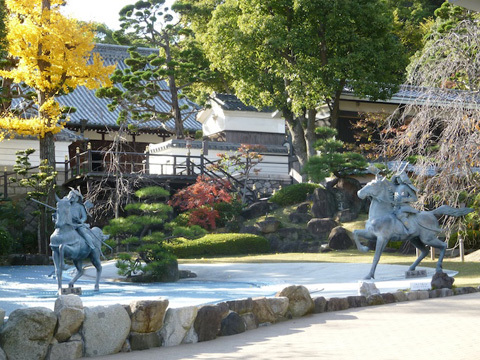 The winners, the Minamoto clan, went on to establish the Kamakura shogunate, and it was from there that Japan transitioned toward a society that centered around samurai. The most famous telling of the conflict between the Taira and Minamoto clans is Tale of the Heike. It conveys the outlook among Japanese that “in this world all things are impermanent; what flourishes will invariably be destroyed.” It is out of this worldview that the spirit of bushido developed and reached its maturity. In the long conflict related in Tale of the Heike, a major battle takes place in what is now Kobe. There we find an episode Japanese people have come to love, and which brings many to tears: it is the tale of Taira no Atsumori and Kumagai Naozane, set in the area around Suma-dera. The military commander of the Minamoto clan (Kumagai Naozane), although agonizing that the young commander of the Taira clan is the same age as his own child, kills him. That young samurai’s identity was not known at the moment of his death. But on his waist, he was carrying the famed flute Aoba (also called Saeda or Wakaba)—the possession of the celebrated flutist Taira no Atsumori. This episode poignantly depicts the samurai’s sense of mission, internal conflict, and the fleeting nature of life. It is said that Naozane, in anguish over what his duties as a samurai entailed, abandoned his position and became a monk. 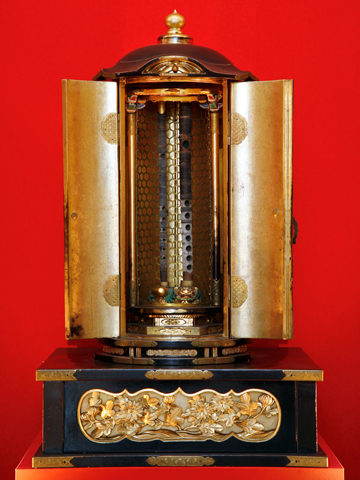 It is also said that the general of the Minamoto clan, Minamoto no Yoshitsune, identified Atsumori’s severed head at Suma-dera; the temple grounds include many sites related to the story. 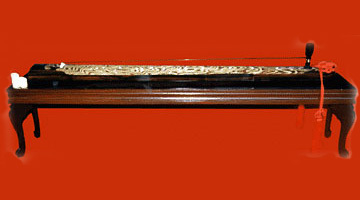 Today, Atsumori’s burial mound can be found at Suma-dera, and memorial services are still performed in his name; his flute, along with many other items related to the Minamoto and Taira clans, can be seen at Suma-dera. Head north 12 minutes from either the Tenjinshita city bus stop, or the JR Suma Station. If taking the Sanyo, Hanshin, or Hankyu trains, get off at Sumadera Station and walk north 5 minutes. If arriving via National Route 2, go north from Suizokuen-mae, turn left on to Rikyu Street, and head west on Kyu-Shinmei Road. Coming from the east, take the Hanshin Expressway, turn off at the Tsukimiyama Interchange to Kyu-Shinmei Road and head west. Coming from the west, take the Daini Shinmei Road, turn off at the Suma Interchange, and turn right at the signal by Rikyu Park. After passing through a tunnel, you will see a parking lot on the left. The parking area accommodates five large-size buses and 30 standard-sized cars. Hours are 8:30 a.m.–5 p.m.
© SUMA-DERA, All Rights Reserved.